Even though most areas along the Front Range of Colorado have seen over 1″ of precipitation in the last couple of weeks, drought conditions continue to affect the region. According to the U.S. Drought Monitor (NOAA’s NCDC), those conditions start along the east side of the Continental Divide and grow steadily worse as you look east and south. 22 counties are completely covered by `Severe` drought conditions. Additional counties have at least some area in the Severe category. Unfortunately, Baca County in southeastern Colorado has slid into the `Extreme` drought category. One of my close friends has a place down there – I know the communities in Baca are growing increasingly worried about these conditions. Some good news might be on the horizon. The moderate La Nina that has been present is finally starting to weaken: neutral El Nino conditions (+/- 0.5C temperature anomalies) are expected to prevail across the tropical Pacific later this year. Combined with the North Atlantic Oscillation retreating from its extreme negative phase earlier this winter to more neutral conditions, the polar and subtropical jet streams should be returning to more “normal” placements and strengths. This could hopefully mean that normal storm tracks will again appear over Colorado this summer. If the monsoon shows up this year, that would be great too. I’m pleased as punch that many mountain sites have near-record snowpack this year. The plains sure could use some moisture moving into 2011. Nobody wants to see the conditions in Texas affect other places. 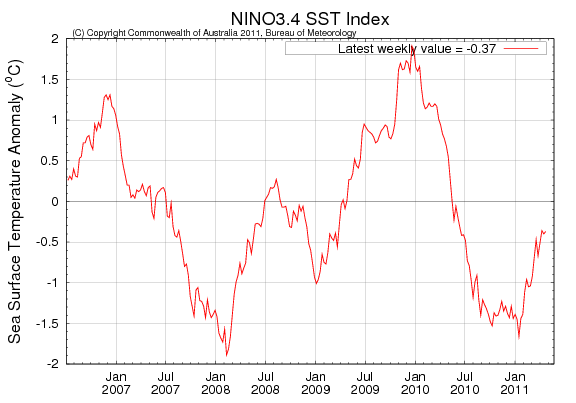 Categories: science | Tags: 2010-2011 Colorado drought, drought, La Nina, North Atlantic Oscillation | Permalink. Glaciers and ice caps in the Canadian Arctic Archipelego have started melting. This will contribute to sea-level rise for the remainder of the 21st century. 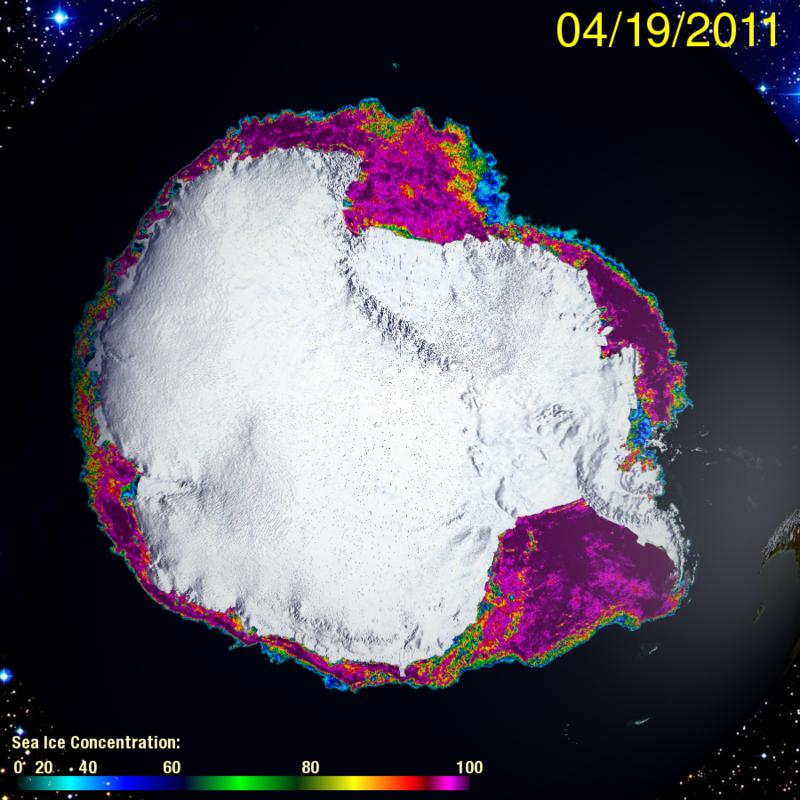 That’s a problem because the area contains one-third of the global volume of land ice outside the ice sheets. Researchers found that the islands lost about 61 gigatonnes of ice per year from 2004 to 2009, enough to raise global sea levels about a millimeter in that time. That rate of melt will only increase in the years ahead. More mass into the world’s oceans and more heat accumulated from global warming means the rate that sea level rise is increasing will also increase. And because of the out-sized influence of the dirty energy industry and its apologists, we remain unprepared for that situation. Preparing for it will only become more expensive with time. Categories: global warming | Tags: global warming, melting glaciers, melting ice caps, sea level rise | Permalink. The state of global polar sea ice area in the middle of April 2011 remains poor: well below climatological conditions (1979-2009) continue to persist. Sea ice in the Arctic continues to track significantly below average, with the 2nd lowest readings for the month in the modern era. Antarctic sea ice has rebounded very slowly from its annual minimum extent, hovering near record low extent values during March and only recently improving in comparison to historical lows in early April. Global sea ice area has therefore remained near historical lows for an extended period of time this year. While global sea ice area has rebounded from its yearly minimum, the difference between this year and climatological conditions has been stuck below negative 1 million sq. km. for the first 3.5 months this year. 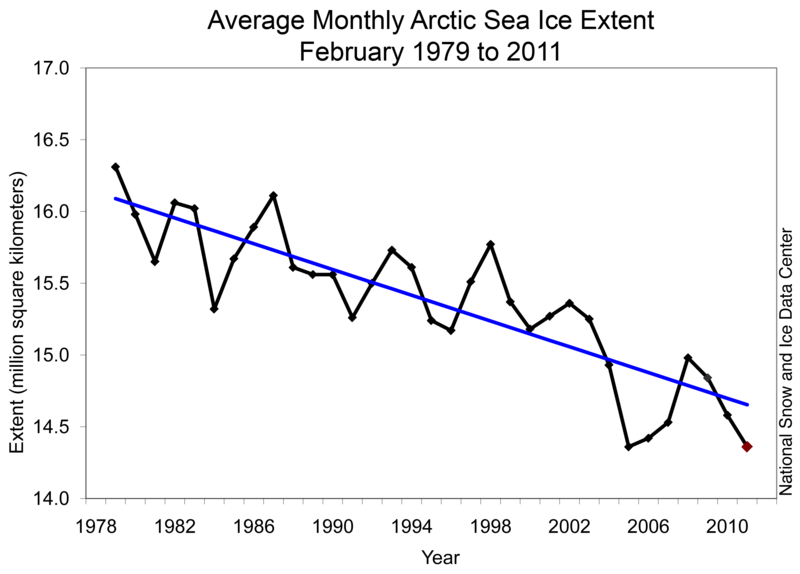 Those conditions mimic the trend seen in early 2006 and 2007. 2006 saw the global area increase to normal conditions later in the year. 2007, in contrast, did not. That, of course, was the year that Arctic sea ice extent plummeted to its lowest value on record. Weather conditions in the Arctic the rest of this year will help determine whether 2011 challenges 2007 for that dubious position. According to the National Snow and Ice Data Center, Arctic sea ice extent in March was the 2nd lowest on record. 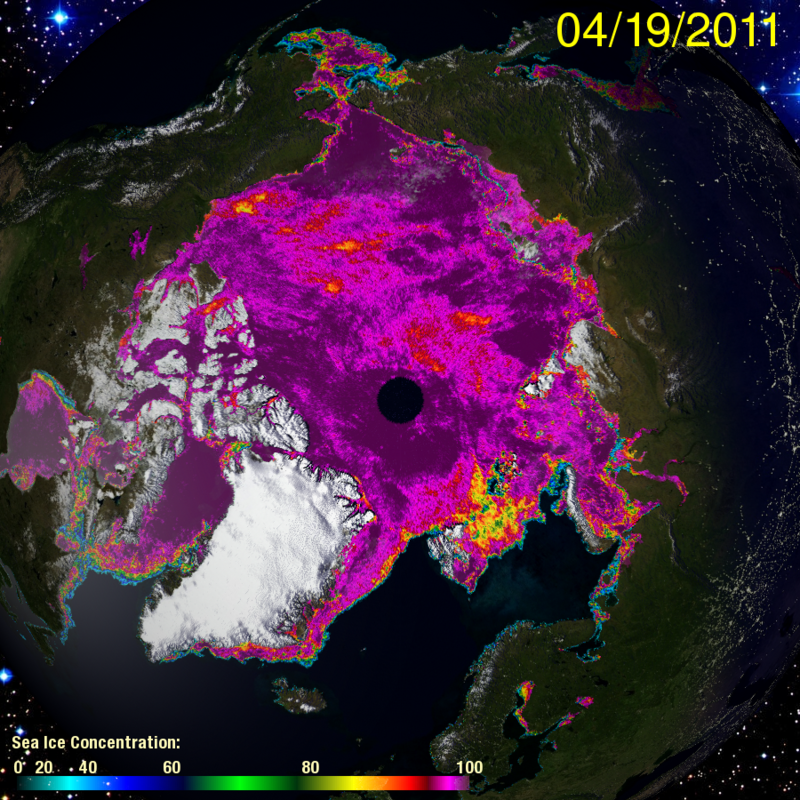 Averaged over March 2010, Arctic sea ice extent was only 14.56 million sq. km. 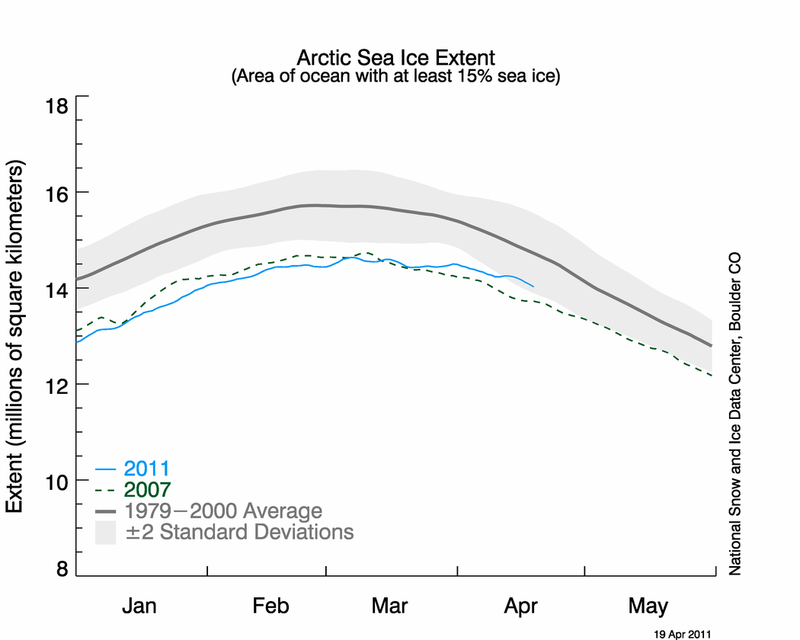 Arctic ice in March and into early April didn’t change very much in its extent. This is definitely typical for March, but less so for April. In fact, overall conditions have held steady since mid-February. While those conditions were extremely low compared to climatological conditions in February, they were less anomalous by the middle of April. Climatologically, the extent starts to really decrease by the beginning of April, so the extent anomaly has sharply decreased in the past month from 1.1 million sq. km. below normal to “only” 574,000 sq. km. below normal now. Hopefully that translates to the lack of record low extents later this year. The change in March ice extent has been measured at -2.7% per decade by the NSIDC. 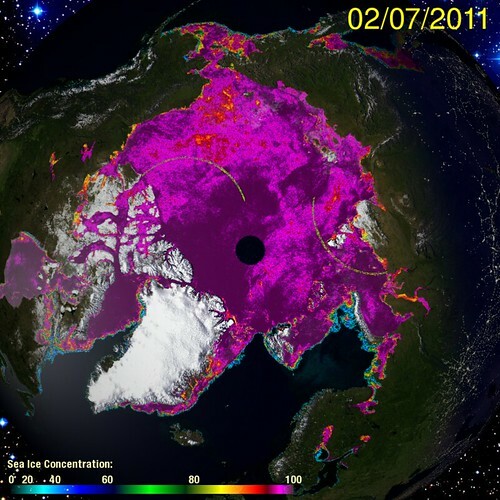 What that means is as of the end of March 2011, the Arctic has only 14.56 million sq. km. of sea ice extent, while as of the end of January1978, the Arctic had 16.49 million sq. km. of sea ice. That difference is real and it is significant. I’m going to do something a little different this month and compare April’s satellite imagery of the Arctic to February’s to demonstrate the general lack of difference between the two. A couple of areas have some lower concentration of sea ice, but the general picture looks the same as it did over two months ago. One important factor in April’s conditions is the Arctic Oscillation’s return to more positive values since the beginning of the year. This has allowed colder air to remain in place over the Arctic region. The NSIDC has included the 2007 time-series line as a useful comparative measure for this year’s extent. After trailing below 2007 conditions for the first 2 months this year, the unchanging extent since early March has meant 2011’s extent is now above 2007’s. At the end of the 2011 series, you can see that this year’s melt season might finally be in effect. Sea ice conditions have obviously increased in the last month, as they should have. To date, I haven’t seen anything regarding the health of the ice shelves ringing the continent. The longer there is no news, the better, since those shelves keep the land-based ice on land and not allowing them to escape to the sea. 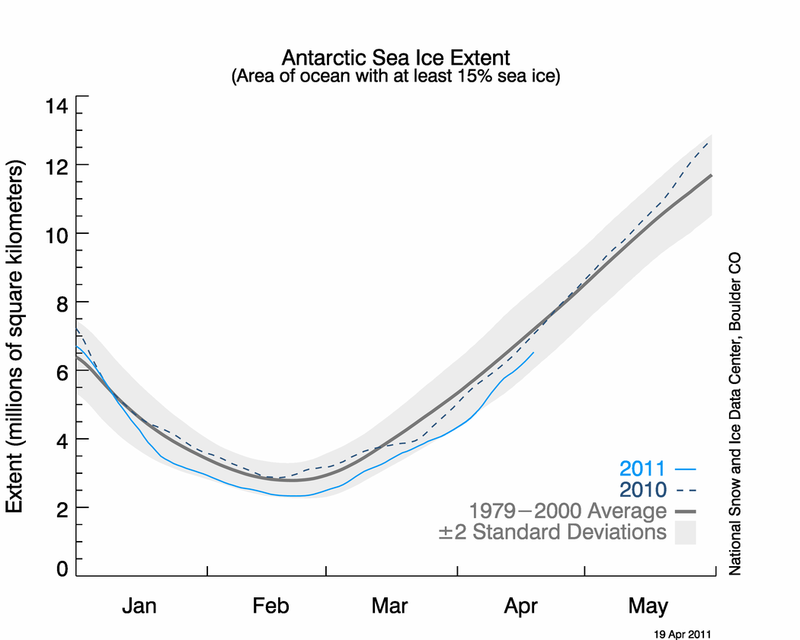 Antarctic sea ice extent has remained on the low side of the climatological envelope of conditions. So far, April has seen more extensive freezing than did March. As you can see, conditions this year have been worse than conditions in 2010. Unlike the Arctic, however, a long-term trend has not been as dramatic in the Antarctic. Here are my State of the Poles posts from March and February. You can find the NSIDC’s April report here. The page is dynamic, so if you’re reading this after April 2011, that month’s report will show up first. If that’s the case, you can look for any report in their archive on the top pull-down tab on the right-hand side of the page. Categories: environment, global warming, NASA, science | Tags: Antarctic sea ice, Antarctic sea ice extent, arctic ice, Arctic sea ice extent, climate change, climate change effects, global sea ice, global warming, ice thickness, NSIDC | Permalink. For those of you who have followed this topic to a reasonable degree, you probably already knew what the lede had to say. For those of you who don’t pay quite as much attention to this topic, this post is especially important. The dirty energy worshippers have screamed about the costs of doing what’s required to keep our climate livable for some time now. Left unsaid during that whole period (thanks for that, corporate media) is the alternative: what would doing nothing and hoping our climate remains livable cost? Some basic studies have been performed to ask that second question in recent years. They mainly deal with large-scale (national) economies and make a ton of generalizations and assumptions. Part of the problem is too little fundamental research has been performed examining what kinds of benefits we enjoy in a livable climate and what they should be worth to us. On top of that, I have spent a lot of time and effort detailing a lot of the disadvantages of the assumptions made and processes left out of climate research to date. Keep that in mind: everything discussed here remains based off of data that contains too many unrealistic assumptions and therefore likely underestimates the problem at hand. Unfortunately, that’s all we have to work with right now. Some of those gaps will continue to be filled in the future, enabling more detailed and accurate cost analyses to be performed. The American Security Project has released analyses for all 50 U.S. states’ costs as a result of doing nothing to stop our climate forcing. The report for my state, Colorado (pdf), has some interesting results. I will begin with an enormously important note underlying their entire analysis: the calculations performed do not include snowfall and icepack melts, which the study itself notes “Coloradans depend on for much of the water supply and recreation”. That seems to me to be a critically important piece of information when judging what costs to society global warming will bring about: will we have water to drink or not? It goes to basic survivability. Nevertheless, the rest of the results have to be viewed through the lack of snowfall and icepack melt lens. Temperatures are expected to rise 4-10ºF by the end of the century. Water shortages could become a regular occurrence throughout the state. Corn and wheat yields are projected to decrease by 8-33% as a result of water shortages. Warmer temperatures and drier summers will lead to more fires throughout the state. Colorado’s $1.9 billion ski industry—which employs 31,000 people – may become unprofitable as decreasing snowpacks will shorten the winter sports season by an estimated 30 days. When global warming scenarios that are based on our current emissions path are considered, some notable differences appear. Temperatures could rise by 13-18ºF by 2060. That’s only 50 years from now, not 90. So much hotter, much sooner. Droughts could occur by 2060 that would make the Dust Bowl look moist by comparison. We’re in line to witness weather extremes that nobody in our species’ existence has faced. With those kinds of higher temperatures and extreme droughts, agriculture and ranching would be impossible to conduct in most areas where they take place today (an increase of only 3-4ºF would likely be enough to force ranchers to move herds out of the state; where they would go instead is an interesting question left unconsidered), wildfires could burn at least twice as much area per fire year (May-October) as they do today. Of course, this year’s wildfire season started months early, thanks to the medium-term drought we’ve been in. If more snow falls as rain in the future, the ski industry will definitely become unprofitable by mid-century. Colorado has the potential to generate more than 35% of its electricity needs from geothermal energy. Its wind energy potential is even greater; the state could generate 1,100% of its current electricity use by employing this renewable source. The state could also generate over 1000% of its current electricity use by leveraging solar energy potential. Will it cost money to switch from dirty to clean energy sources? Absolutely – nobody has ever seriously advocated otherwise. But would the costs of not making that switch be even higher? Yes. According to the International Energy Agency (IEA), the world will have to spend an extra $500 billion to cut carbon emissions for each year it delays implementing serious action on global warming. This would be on top of the $10.5 trillion investment needed from 2010 to 2030 to boost renewable energy development and improve energy efficiency. And that’s just added costs to switching our energy infrastructure. That analysis didn’t look at rising sea levels, rising temperatures, more severe droughts, acidified oceans, or geopolitical unrest as millions more climate refugees start moving around, etc. Suddenly, the costs of switching to renewable energies and living more efficiently looks pretty cheap. Categories: environment, global warming | Tags: agriculture, climate change action costs, climate change inaction costs, IEA, ranching, renewable energy, snowpack, temperature rise, wildfire | Permalink. Will Democrats Push Back On Republican Teabaggers’ Attempt To Gut Medicare? And I really do think it’s that simple. Obama has already ceded the majority of the ground that could honestly be considered liberal. That’s the way he wants it; that’s the way his handlers want it; it’s become the way his supporters want it. He’s made plenty of pretty-sounding speeches about the topic, saying over and over he won’t let Medicare be turned into a voucher system. Which tells me that is where things will end up when all is said and done. Contractual obligations don’t matter to this man or his staff. Staying in power does. Mark my words: the big 3 contractual obligations run by the federal government will look very different after Obama and other “Democrats” are done with them. Those changes might not take place immediately, but they’ll take place. Just like his health care system reform insurance giveaway – the biggest changes still won’t take place for years, but they’re coming. And when they get here, it’s not as if the system will be better than was before the reform. And the Obama drones will swear up and down that the destruction of Medicare will be as good for all of us as the health insurance giveaway was. Want to prove me wrong, Obama? Fine, prove me wrong. Don’t let Republican Teabaggers start the process to destroy programs that have worked quite well for generations. Actions speak louder than words. Stand up to extremists for once instead of trying to figure out a way to help them stab the rest of us in the back. Categories: framing, health care, politics | Tags: Medicare, pre-capitulation, Republican Teabaggers | Permalink. An average of 392.40ppm CO2 concentration was measured at NOAA’s Mauna Loa, Hawai’i’s Observatory during March 2011. That value is the 3rd highest in recorded history, behind April and May 2010. 392.40 is the highest March value ever recorded. It is 1.39ppm higher than March 2010. It is 0.63ppm higher than February 2011. A rough extrapolation of last month’s concentration projects out to 394-395ppm in May, the month during which the yearly maximum concentration is recorded. This will likely be the last year that CO2 concentrations will fall below 390ppm during any calendar month. The aggressive march toward 400ppm continues. Keep in mind that scientists have recommended that 350ppm is the current target for which humanity should aim in order to keep climate extremes from overwhelming our civilization. Categories: environment, global warming, science | Tags: 350ppm, 390ppm, 400ppm, CO2 concentration, CO2 concentrations, Mauna Loa Observatory, NOAA | Permalink. If you haven’t heard or read by now, I’m sorry to be the first to let you know: as of early 2011, eastern Colorado is experiencing a severe drought. The mountains and the western slope are doing just fine, thanks to a strong La Nina that has brought above-average precipitation to western Colorado all winter. The eastern plains, however, have received scant precipitation dating back to just after July 4th, 2010. the precipitation that has fallen in the Denver metro area, for example, since that time has been largely confined to singular events followed by weeks of no precipitation. Coyote Gulch has a piece on what this means for the Arkansas Valley farmers. For the record, as dry as it has been over eastern Colorado for the past 9+ months, Oklahoma and Texas are doing relatively worse. Extreme drought conditions exist over a large part of southern Oklahoma and most of Texas. A portion of Texas near Houston is experiencing Exceptional drought conditions. The same La Nina that has brought near-record snowpack to the Sierra Nevadas and saturated the Pacific Northwest has left the southern U.S. high and dry. That’s not expected to change in the next 3 months as the La Nina slowly weakens and the tropical Pacific returns to neutral conditions. In the long term, these kinds of events are only going to become more likely and more severe, regardless of the specific strength of a particular La Nina or other short-term climate oscillation. I’m not saying this drought will continue for years to come, but as a result of our climate forcing, the drought dice are being loaded more and more. We will learn what it’s like to hit a 13 or 14 on 2 six-sided die that we’re painting with extra numbers this century. Mankind has never had to deal with the kind of climate extremes that will occur. The effects of this drought have yet to really be felt. Once they do, we should all ask ourselves how prepared we are to face much more severe droughts in the future. Categories: environment, global warming, science | Tags: 2010-2011 La Nina, 2011 drought, Colorado drought, Oklahoma drought, Texas drought | Permalink.